New research shows that industrial fisheries are responsible for dumping nearly 10 million tonnes of perfectly good fish back into the ocean each year — enough to fill 4,500 Olympic-sized swimming pools. This news comes at a time when nearly 90 percent of the world’s fish stocks are threatened by overfishing. The research, published in the science journal Fish and Fisheries, shows that roughly 10 percent of the world’s annual catch is tossed back in the ocean. This waste happens for a number of reasons, including fishing practices that damage fish (making them unmarketable), throwing back fish that are too small or out of season, or because only part of the fish needs to be harvested (e.g. Alaska pollock roe). In some cases, fishers caught species they weren’t targeting (called bycatch), or they continue to catch fish even though they’ve caught enough, which they do in hopes of scooping up bigger fish (called high-grading). 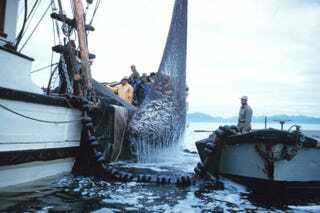 For the study, the researchers examined the amount of fish that has been discarded over the past six decades. Estimates were made for all major fisheries around the world relying on, in the words of the authors, “a wide variety of data and information sources and on conservative assumptions to ensure comprehensive and complete time-series coverage.” Their analysis shows that five million tons of fish were discarded annually in the 1950s, a figure that skyrocketed to 18 tons annually by the late 1980s. This figure dropped to less than 10 million tons over the last decade. Disturbingly, the authors think these numbers are going down at least in part because of overfishing. Fishing operations are now catching fewer fish each year, so there’s less to dump back into the ocean. 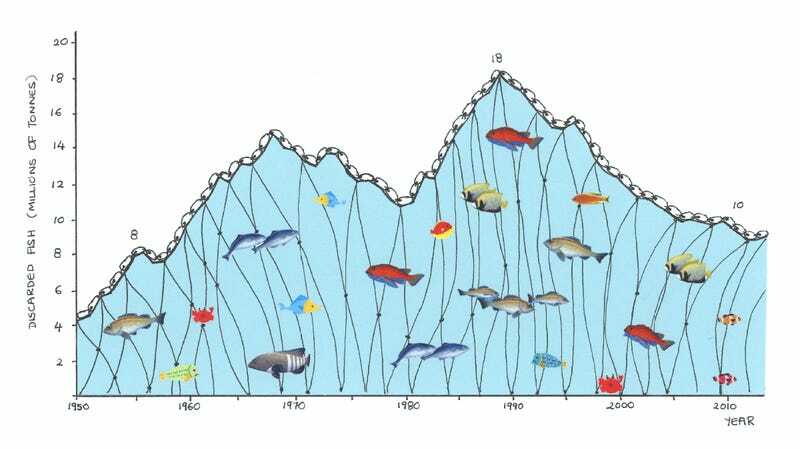 Fish waste happened primarily in northern Atlantic waters in the earlier decades (1950s to 1980s), after which time it shifted to Northwest Pacific and Western Central Pacific waters. Indeed, this study has uncovered a disturbing trend: fishing fleets are moving to new waters when there’s no more fish to catch. “The shift of discards from Atlantic to Pacific waters shows a dangerous trend in fisheries of exporting our fishing needs and fishing problems to new areas,” said study co-author Tim Cashion, a researcher from the University of British Columbia.